GhostBed vs. Purple Mattress Review: Which One is Right for You? It’s often not easy to choose which mattress is best for you. Many people narrow it down to a choice between two, having assessed which two may suit them. If you prefer your mattress to have a responsive, bouncy surface to it and to be a bit firmer than average, then the GhostBed and the Purple Mattress would suit you admirably. But which? Which of these two appealing mattresses should you choose? Here we present our GhostBed vs. Purple Mattress review to help you come to a decision. Who Would Want a Purple Mattress? Layer 1: 1.5 inches of 3.5 PCF aerated Dunlop latex foam. Layer 2: 2 inches of 4 pcf gel memory foam. Layer 3: 7.5 inches of a 2 PCF high density support polyfoam. The Purple Mattress has a soft, thin cover. Layer 1: 2” of a hyper-elastic polymer foam – known as the Purple Smart Comfort Grid. Layer 2: 5” of a plush comfort foam. Layer 3: 4” of the poly foam support layer. As you can see, the GhostBed is 1.5 inches thicker than the Purple Mattress and each has the same number of layers. The difference in height, or thickness, is not necessarily relevant unless you like a high mattress, in which case there is just 1.5 inches in it. What is more important is how the various layers work together to provide you with a comfortable sleeping surface with the properties you need. Bounce and Responsiveness: The GhostBed is more responsive than the Purple Mattress and provides slightly more bounce. This makes it a more suitable mattress for active adults. This is due to the Dunlop latex top layer: Dunlop latex gives less bounce or resilience than Talalay Latex but is better than memory foam for this property. The hyper-elastic gel memory foam of the Purple Mattress tends to make it more easy to sink into, and therefore not so good for adult night games. However, it does provide a level of bounce and may be enough for adults that like a slightly firmer bed to sleep on. Cooling Properties: The top layer of the GhostBed is aerated latex which provides a good level of breathability. This mattress also has a cooling gel-infused memory foam layer. This construction helps to keep the mattress cool when in use. However, the Purple Mattress is even cooler. The smart-grid structure of the top layer of this mattress allows for superb airflow in and out of the mattress. When you consider the breathability of the two lower layers, this mattress offers a high level of cooling. Firmness: On a 1 – 10 scale where 10 is firmest the Purple Mattress is around 6.5 – 7 while the GhostBed is slightly firmer at around 7.5. Heavier weight users at 215 – 230 lb may possibly find the GhostBed too hard for them. They may find themselves sinking through the comfort layers and grounding on the harder support layer. This may be particularly so in the case of side sleepers where the pressure is exerted on the sharp contours of the hips, shoulders and perhaps elbows. Edge Support: The GhostBed has the better edge support of the two. Not only is it a firmer mattress overall, but its construction helps to promote edge support. There’s not a great deal in it, and if you tend to sit on the edge of the bed, particularly the middle, then you can feel slightly less secure than closer to each end. The GhostBed makes you feel slightly less like rolling off the edge of the mattress than the Purple does. Motion Transfer: When sleeping with a partner, you don’t want to be disturbed when he or she moves around on the bed. In this regard, the Purple Mattress comes out tops due to the structure of its foam layers. The latex of the GhostBed is not good at absorbing movement. We could detect some movement on the other side of the bed during our trial. Memory foam is generally better than latex, and even though this mattress has a memory foam second layer, it is not enough to eliminate motion transfer. The Purple Mattress was superior in this regard. GhostBed Trial: 101 night sleep trial: mandatory 30 nights period of use. Purple Mattress Trial: 100 nights sleep trial – no mandatory period of use. In each case, the company will provide a full refund plus pay transport costs for returned mattresses. Purple Mattress Warranty: 10 years non-prorated. Purple will either repair or replace a faulty mattress during the first 10 years of use at its own discretion. Who Would Prefer the GhostBed and Purple? You sleep on your back or your stomach. Heavier back sleepers may prefer the Purple mattress. You want a mattress with the bounce of latex, but without the high price tag usually associated with latex. You are an active young couple. You tend to sleep hot: both the Ghostbed and the Purple mattress offer good cooling properties. You prefer a medium-firm mattress to a firm one. You are fairly lightweight (150 lb or less): the GhostBed might feel a bit hard for you. You sleep on your side: the Purple mattress absorbs the pressure of your shoulders and hips better than the firmer GhostBed. If you also sometimes turn onto your back, then the Purple mattress is ideal. You want a fast-response mattress. It should be noted here that both companies have launched a new version of their mattress for 2019. These are now available along with the original versions reviewed above. What are the changes in the new version? Some are quite radical, to the extent that the new versions have totally different characteristics to the originals. Here is how the new versions compare with the originals. A Ghost Ice layer, which uses phase change technology to keep you cool. This cutting edge layer cools down any heat reaching it from your body. A 2-inch layer of gel memory foam – this is memory foam infused with gel beads that absorb heat and distributes it throughout the entire layer for dissipation into the atmosphere. A 2-inch layer of a bouncy yet conforming viscoelastic foam. It combines the bounciness of latex with the comfort of memory foam. A 7.5-inch layer of high-density support foam to provide the strength and main support of the mattress. The overall result is a 13-inch thick mattress with superb cooling properties and the comfort of memory foam. It is softer than the standard GhostBed, standing at around 5.5 – 6.0 on the 1 – 10 scale (in comparison to around 7.5 of the standard mattress.) We feel that it has lost some of the bounciness of the original GhostBed due to the memory foam which is absent in the original. There is a price to pay for these differences, and the GhostBed Luxe is more expensive than the standard GhostBed mattress. It is ideal for side sleepers for whom the standard GhostBed is too firm. The memory and viscoelastic foams provide the comfortable support needed for side and back sleepers, while the standard GhostBed is generally unsuitable for most side sleepers. The main benefit of the GhostBed Luxe mattress is its superior cooling powers and general softness compared to the original. It is softer even than the Purple Mattress. This makes it more of a universal mattress than the original. The new Purple Mattress is a hybrid. And is available in 11-inch, 12-inch, and 13-inch thicknesses. Depending on the model you prefer, the three firmness ratings are 4.5 (Medium Soft), 5.5 (Medium) and 6.5 (Medium Firm). These compare to the 6.5- 7.0 of the original. 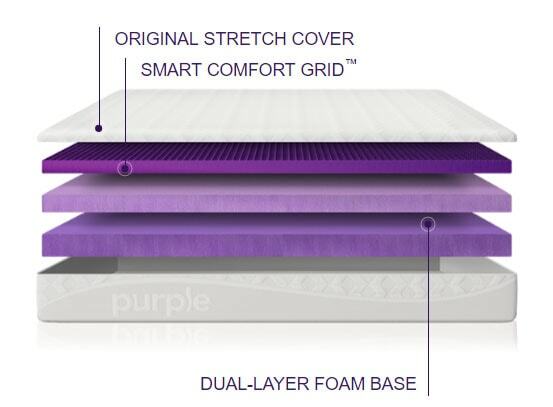 Both the new and the original Purple Mattresses feature the Comfort Grid as the top layer (in the form of rows of square empty boxes of foam), providing excellent aeration and air movement to help remove heat while you sleep. It is the thickness of the walls of these boxes that determine the firmness level of the mattress. Here are the main differences between the original and new Purple mattress. The original Purple mattress was all foam, whereas the new Purple mattress is a hybrid, containing individually pocketed spring coils. The space between the coils increases the cooling properties of the mattress, and also improves its motion isolation properties. Layer 1: As stated, the Comfort Grid is still present as the top layer. The three comfort levels referred to as Purple 2, 3 and 4 are 2, 3 and 4 inches thick respectively. Layer 2: This is a thin transition layer of polyurethane foam to separate the Comfort Grid from the layer of coils. Layer 3: Rather than a support layer of high density foam, the new Purple mattress has a 7.5-inch layer of individually wrapped responsive coils. These provide excellent support and also improved motion separation. The result is a cool, responsive mattress with better bounce than the original, and an additional 4-inch layer of poly foam edge support material improves the support of the mattress right to the very edge. This also helps you get into and out of bed without the edges collapsing on you. 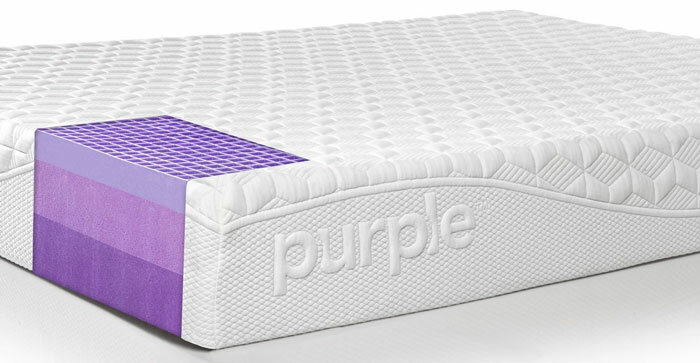 According to Purple, both its mattresses are ‘temperature neutral’ through the construction of the new mattress will tend to allow better air circulation than the original. The new GhostBed is still cooler than the new Purple mattress, however. Both Purple mattresses provide better pressure relief than either of the GhostBed mattresses. Here are some questions we have been asked about the GhostBed and Purple mattresses. 1. Which is the best mattress between the two GhostBeds and the two Purples? A lot depends on what you mean by ‘best’: your weight is a factor, as are whether there are one or more people sleeping together and how you sleep. There is also the question of whether you prefer a 100% foam mattress or a hybrid, and whether or not you prefer latex or memory foam. Between them, the four mattresses cover all of these options. Keep in mind that between them, the various mattresses range in firmness from 5.5 to 7.5 on a 1 – 10 scale (where 10 is firmest). If you mainly sleep on your side and back, then you will likely find the original Purple mattress best for you. If you sleep on your stomach then the original GhostBed may suit you best. The new GhostBed is softer than the original, so should be better for lightweight people while heavier people may prefer either of the Purple mattresses. If you are continually getting wakened by the movement of a partner then the new hybrid Purple mattress would suit you best. You can choose the comfort level you think best for you: softer for lightweights and firmer for heavyweights. If you tend to get too hot when sleeping, then you might prefer the new GhostBed with the new Purple mattress coming second for its cooling properties. 2. Which bed has the best bounce? My partner and I like a bouncy mattress. Innerspring mattresses tend to provide a good bounce. This should point you to the new Purple mattress, with the original GhostBed next. The latex in the GhostBed provides a reasonable bounce but not great. Dunlop latex is less bouncy and springy than Talalay latex. 3. How do I know which of these four mattresses to purchase? I sleep on my back, weigh just over 210 lb and my partner weighs 120 lb and tends to sleep mostly on her side. What if I choose the wrong mattress? It’s usually not easy to make a choice where partners are of different weights and sleep in different positions. From your information, we would suggest the original Purple Mattress (5.5 – 6.0 comfort level). It is good for heavier back sleepers and lighter side sleepers. If you find you have made the wrong choice you can always use the sleep trial – but keep in mind that you will likely be unable to return your second choice. Most firms permit just the one return if the mattress doesn’t suit you. Another option is to purchase two different Twin XL mattresses and use them side by side on a king-size base or adjustable frame – known as a Split King. 4. I am fairly heavy at 220 lb and sleep on my side. Which mattress would be best for me? We generally recommend the Purple mattress for heavier weight side sleepers. The 3.5 inches of the GhostBed might not be enough to support your shoulders and hips before they bottom put on the firm support layer. The initial 5.5 inches of the two top layers in the original Purple mattress should be enough to support your weight without compressing your hips and shoulders. You could also try the medium firm version of the new Purple mattress, with 4-inches of Comfort Grid foam. 5. Why did each company develop the alternative versions of their mattress? We cannot read their minds, but it is likely because of the success of their respective first versions. Both these mattresses have been well received in the market, and in the GhostBed vs. Purple mattress battle it would have become evident to GhostBed that its cooling properties needed improvement, and to Purple that they needed a range of comfort levels, not just the one. Most developments are based on consumer comments and demand, while a few are also carried out in response to the progress of modern technology (e.g. phase change technology). We have provided the information you require to choose between the new and old GhostBed and Purple mattresses. Those who prefer a firmer-feeling mattress will prefer the GhostBed, with the new GhostBed offering improved cooling for those that tend to overheat at night. No more waking up hot and sweaty! Those who want a choice of comfort level can go for the new Purple mattress. While the original is still likely best for side sleepers, the new Purple mattress offers three different comfort levels. The choice is yours, and if you choose wrongly you can use the sleep trial period to return the mattress free and choose another! That is not the best way to find the best mattress for your needs, but it is one way to help you acquire the most suitable mattress. Our GhostBed vs. Purple mattress review should help you get it right first time!